Over the Christmas Holidays, Tati traveled to Klungkung, where we had our Bali Training Center, to visit families and the children there that we continue to support. AHFC funds were used to buy new school shoes and supplies, and also Christmas Gift snacks for those children. Many of the people cried and told Tati how much they missed her and Opa Dan and the activities the Training Center offered for nearly 5 years. Saturday Dec. 12th, marked the end of the school semester for the Indonesian children, who will now have a 15 day holiday. This means that our North Bali base house will become home for many kiddos from the surrounding area during their vacation time. As in years past, former Orphanage and Training Center students now working in the main city of Denpasar, who have no family connections in Bali, will also be spending the 4 day Christmas Holiday weekend with us. It's a wonderful time to reminisce, to give them our attention and let them know that they are loved. 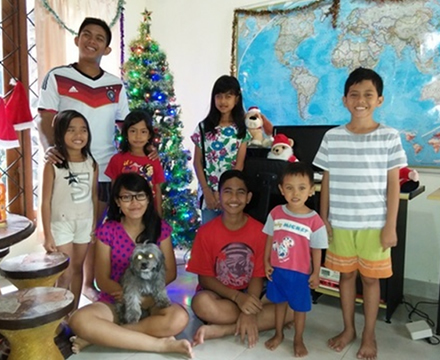 The Kiddos in the above picture Putri 17 (holding Ling Ling), Bayu 14, Risky 2, Timothy 9, Riza 8, Dina 7, Devi 10 and John 17, are our live in family. Tati and I want to thank all of our faithful and generous contributors, whose donations have made it possible for us to help so many children receive food, clothing, an education, health care and a loving home to those kiddos who live at Mothers Heart Orphanage and at our home base here in North Bali. All of us at A Heart For Children hope you have a very Joyful and Happy New Year.